These delicious and versatile nuts contain filling protein and fibre, and vitamin E, a powerful antioxidant. They're also a good source of magnesium, a mineral your body must have in order to produce energy, build and maintain muscle tissue, and regulate blood sugar. Stable blood-sugar levels help prevent cravings that can lead to overeating and weight gain. But what makes almonds most interesting is their ability to block calories. Research indicates that the composition of their cell walls may help reduce the absorption of all of their fat, making them an extra-lean nut. Try for around 23 almonds per day, with approximately 160 calories. Adding fresh peppermint to smoothies, soups or steeping in hot water along with some ginger are great ways to incorporate this bloat busting green into your daily diet. Mint assists with digestion and has relaxant and antispasmodic properties and can help relieve cramps and spasms in the gastrointestinal tract, bile duct and gallbladder. This improves the passage of both food and swallowed air through the digestive tract, allowing them to go through smoothly and without pain or discomfort. The volatile oils in peppermint stimulate the gallbladder to release bile that your body uses to digest fats. The flow of bile to the liver can also be increased by the compounds in peppermint tea and moderate intake of the herb seems to have a detoxifying effect on the liver. A well-functioning liver is vital to overall digestive health and therefore reducing flatulence problems. Try for: 1 cup fresh mint added to foods, or 8 cups of warm mint tea per day. A 2003 study in the journal Nutrition found that overweight women who consumed three apples or pears a day for three months lost more weight than their counterparts who were fed a similar diet with oat cookies instead of fruits. A large apple has five grams of fibre, but it's also nearly 85 percent water, which helps you feel full. Apples also contain quercetin, a compound shown to help fight certain cancers, reduce cholesterol damage, and promote healthy lungs. Try for an apple (or two) a day. Most are loaded with fibre which is essential for a flat tummy.The more fibre you eat (between 25 and 35 grams every day) — the fewer calories you absorb from all the other stuff you put in your mouth. That's because fibre traps food particles and shuttles them out of your system before they're fully digested. 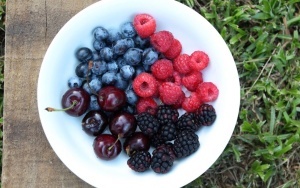 Berries (and other fruits) are also high in antioxidants, which not only help protect you from chronic diseases like cancer but may also help you get more results from your workouts. Antioxidants help improve blood flow, which can help muscles contract more efficiently. Try for: At least half a cup daily. Don't limit yourself to the usual suspects, like raspberries, blueberries, and strawberries. If you can find them, add boysenberries, gooseberries, and black currants to the mix for excitement. Their cancer-preventing carotenoids won't help shrink your waistline, but their low calorie count definitely will. One cup of spinach contains only about 40 calories, while a cup of broccoli has 55 calories and satisfies 20 percent of your day's fibre requirement. Most leafy greens are also a good source of calcium, an essential ingredient for muscle contraction. In other words, they help fuel your workouts. Try for: Three servings daily. Keep a bag of prewashed baby spinach in your fridge and toss a handful into soups, salads, stir-fries, and sandwiches. When you get sick of spinach, reach for a bunch of arugula, broccoli rabe, or broccolini. People who get their calcium from yogurt rather than from other sources may lose more weight around their midsection, according to a recent study published in the International Journal of Obesity. The probiotic bacteria in most yogurts help keep your digestive system healthy, which translates into a lower incidence of gas, bloating, and constipation, which can keep your tummy looking flat.Try for: One cup of full cream yogurt per day. Choose unsweetened yogurt that contains live active cultures. Add a handful of fresh chopped fruit for flavor and extra fibre. Ginger tea has muscle relaxant properties that can help relieve gases trapped in a constricted digestive system. Bloating and intestinal cramps are often caused by tension and spasms in the gastrointestinal tract. By gently relieving these constrictions ginger tea can help release trapped digestive gases and alleviate bloating. This same calmative, relaxing effect on your intestinal environment is likely to be the reason why the tea is such an effective remedy for excessive flatulence. By stimulating the process of digestion and relaxing the smooth muscles of the digestive tract, ginger tea helps the food you eat pass through your system more easily.The more smoothly and effectively your meals travel through your gastrointestinal tract, the less chance of blockages in your system that can lead to prolonged food fermentation. Try for: 3-4 cups of ginger tea per day. Combine with mint leaves for maximum impact. Seafood, especially fatty fish like salmon, tuna, and mackerel, is an excellent source of omega-3 fatty acids. These uber-healthy fats may help promote fat burning by making your metabolism more efficient. Salmon also helps slow digestion, prevent cravings, and is excellent source of abs-friendly protein. Try for: Two 500g servings per week. Wild salmon, though pricey, contains more omega-3 fatty acids than farm-raised. (If it doesn't say wild, it's farm-raised.) If seafood's not your thing, you can get your omega-3's from flaxseed (grind and sprinkle on your cereal) or walnuts. Never heard of it? Pronounced KEEN-wah, this whole grain contains 5 grams of fibre and 11 grams of protein per half cup. Cook it as you would any other grain (although some brands require rinsing). Quinoa's nutty flavor and crunchy-yet-chewy texture are like a cross between whole-wheat couscous and short-grain brown rice. Try for: At least one half-cup serving (a third of your whole-grain requirements) per day.